The day that Yankees fans have been dreading for the entire season is finally here. Tonight, Derek Jeter will take the Yankee Stadium field for the final time. After being officially eliminated from playoff contention in yesterday’s game, today’s game will strictly be about Jeter. I view the loss yesterday as a positive thing because in my mind, the Yankees have been out of the playoff hunt for a few weeks now. By losing yesterday, it allows the Yankees a final night at home in which they can properly honor and thank their captain. Could you imagine if they won yesterday and their playoff hopes were still alive? There would be no focus on Jeter, but rather the game, which of course is the way Derek would want it. But instead it’ll give fans a night that they’ll probably remember for the rest of their lives. The Yankees have been doing a promotion called “#OneWordFor2” in which fans, players, and managers describe Derek Jeter in one word. While I don’t think I can only come up with one word, I’d like to give a few words that best describe Derek. I’ve never seen a athlete play his sport with more heart than Derek Jeter. Day in and day out, Jeter gives it his all. From hustling on every ground ball, to that iconic fist pump, nobody has more heart than him, and nobody ever will. Jeter will most likely be a first ballot hall of famer, and could very well be the first player to be unanimously voted in to the Baseball Hall of Fame. His five rings help him with this category too. There’s only one number two out there that people will remember and that’s Derek Jeter. When his number is retired by the team (next season? ), It’ll mark the final single digit number to be retired by the Yankees. When I think of the Yankees, my first thought is Derek Jeter. Derek has been the face of the Yankees for twenty years. He’s been a Yankees fan for his entire life, even when growing up in Michigan. Derek also puts the Yankees before himself, and doesn’t like being the lone man in the spotlight. When asked about himself, he’s been known to always bring it back to the team. In fact, he announced his retirement online so that it didn’t have to be all about him. Sure Jeter can be replaced when looking at this season’s statistics, but there’s never going to be a player of his class, attitude and demeanor. The way Jeter handles himself on and off the field cannot be replicated. 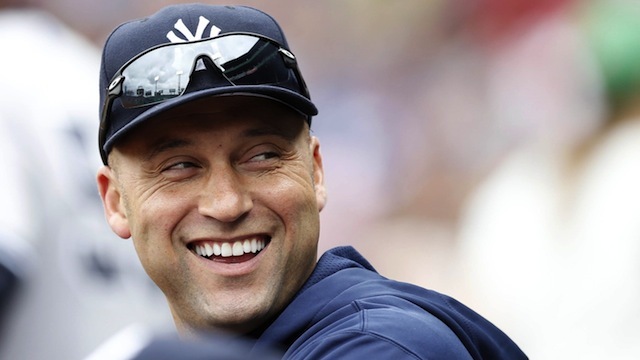 Many players try to mold their characters based on Jeter, but nobody can truly be the same. I’ve been a bit upset over the past few days, watching Derek play out the homestretch of his career. Derek Jeter has been my favorite athlete for my entire life. I’ve never watched a Yankees team that didn’t have Jeter on the roster. Derek has been a huge inspiration to me both on and off the field. Watching the Yankees play while Jeter was injured last year was a bit tough, and I knew that Jeter’s career would be soon be over, but he taught me to never give up and to battle back when the odds are against you. He taught me to put the team before yourself, and that if you try hard enough, your dreams will come true. Tonight marks the end of an era, for both Derek and myself. Derek will always be my role model, and I’m always striving to be the kind of person that he is. He will always be my favorite athlete, and I’ll miss him dearly. Derek was named the 11th Yankees captain in history, and would go on to be the Yankees’ longest tenured captain. Jeter came back from injury last season by crushing the first pitch he saw for a home run. I’ll never forget this moment either. Thank god there wasn’t instant replay at that time. Derek gave one of the most memorable speeches you’ll ever see. Derek took David Price deep and homered for his 3000th hit. A huge walkoff home run that took place just after midnight on November 1, earning Derek the nickname, Mr. November. I remember watching this game live on television and at the age of 7, I knew that it was one of the greatest defensive plays I’d ever see. One of the more iconic plays that I’ll remember. It came in one of the greatest regular season games you’ll ever watch. One of the first World Series in which I watched every out of every game. In first grade, the Yankees-Mets rivalry was strong, and so I knew it would be a series that I’d remember. Of course, my guy Derek won the MVP in that series and I didn’t have to bother with the Mets fans in school.